I was leaving pilates class today at Denver University, when I stopped to tease a fellow student sitting on a bench outside after the class had finished, "Aren't you staying for the third hour?" "No," she responded in a heavy German accent, looking unsatisfied, "I'm used to more active pilates. I need to sweat." For added affect, she repeated it another two times, "I need to sweat." "I need to sweat!" Interesting. That makes three reminders in a row this week that when it comes to exercise - effort really matters. 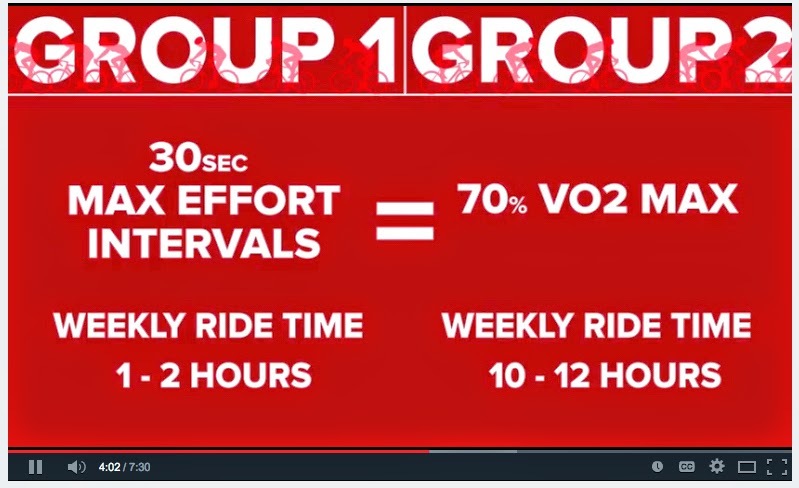 First, I saw this to the point video by my fav Global Cycling Network (GCN) crew, which basically summed up this point - a short amount of hard effort = a long amount of moderate effort. Making two hours really count! But not considering the fun had by the group riding 10-12 hours. Basically GCN is preaching variability and purpose when it comes to training for cycling, while stating great gains can be made in just two hours a week. Great news for all of us during these cold winter months. Watch the GCN video here: Base Training - Fact Or Fiction? (Feb 6, 2015). It'll make you so happy to learn you don't need to ride for 4-hours in the rain. Then this morning, I read an article in The New York Times from a couple of weeks ago, titled, Why Your Workout Should Be High-Intensity, which basically states even if you are suffering from chronic diseases (or tend to over-sensationalize injuries as I do), that giving a good solid effort is more beneficial than plodding along in standard go mode. Then, as I mentioned before, I met the I need to sweat lady. Okay I get the message. Common sense already tells me that as humans, I am guessing we did a lot more flighting than we did fighting or we wouldn't have survived to be here today. I reason that genetics makes us far better at these quick bursts of effort than many of us would first believe. I for one like the savings in time. I also like the mental entertainment. I also like the hope that there is some proven method that will make me a better faster cyclist. That is, until the next batch of studies proves that we should have been doing it all in a totally different way. Until then, I am going to be bursting forth in great effort and proclaiming I need to sweat!